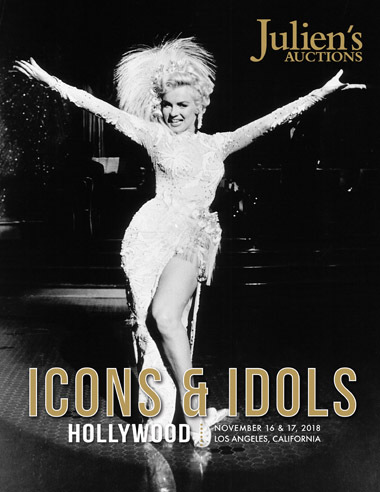 This November’s auction extravaganza offers some of Hollywood’s most spectacular pieces from the Golden Age of Hollywood to today’s modern Hollywood icons to iconic legends, as well as a selection of never-before-seen auction firsts including the newly discovered personal property of one of Hollywood’s greatest screen legends, Marilyn Monroe. Important selections of newly discovered items from the storage of the legend’s personal property include a black silk ensemble worn by Monroe to a 1956 press conference, furniture from the Connecticut farm she shared with Arthur Miller, her 1961 Golden Globe award for World Film Favorite 1961 and her previously announced 1956 Raven Black Ford Thunderbird. Other highlights of the two day sale include: a 1946 jeep owned by American cowboy icon Roy Rogers; the person collection of beloved comedienne television icon Rose Marie - encompassing scripts, costumes, personal wardrobe and jewelry; one of the largest collections of Harold Lloyd’s renowned, signed photographs; a wedding gift bag from the marriage of Prince Harry to Meghan Markle; two 1998 letters written by Princess Diana on her personal stationary; a bat cowl worn by George Clooney in the 1997 blockbuster Batman; Patrick Swayze’s 2009 GT-R Couple Premium Sports Car; Charlie Chaplain’s original bamboo cane gifted to acting coach legend Lee Strasberg; an original 1942 Walt Disney production Bambi celluloid and much, much more. 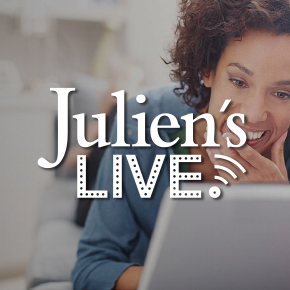 For More Information, please email info@juliensauctions.com or call 310-836-1818.